The craft or art of writing is the clumsy attempt to find symbols for the wordlessness. In utter loneliness a writer tries to explain the inexplicable. And sometimes if he is very fortunate, and if the time is right, a little of what he is trying to do trickles through – not ever much. And if he is a writer wise enough to know it can’t be done, then he is not a writer at all. A good writer always works at the impossible. 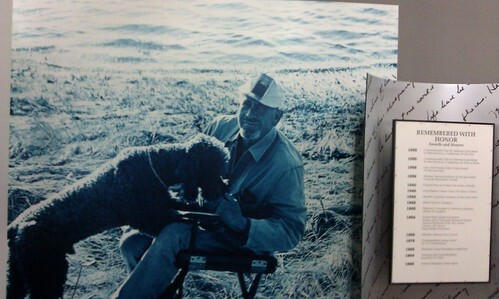 I visited the National Steinbeck Center in Salinas by myself on a Thursday afternoon when almost no one else was there. I wound around the exhibits, wandering in his life and words. When I came to the photo you see above and looked into his eyes, I stumbled backward from the force of his gaze. The time and space between us disappeared with the recognition of what he was. He was a writer. An odd misfit, a sensitive soul, someone unwilling to follow a normal path. He made his own way, taking up with all kinds of nutty people – drunks, prostitutes, biologists, soldiers – yet always writing. He told small stories and big ones. He sided with the underdog, over and over, even when he was called a Communist and denounced by religious leaders. I looked into his eyes and I saw him…and I also saw me. I’m no Steinbeck – he worked harder and more seriously than I ever have, and he was more talented than I ever will be. I also saw you, my fellow bloggers and writer-friends. We are all a part of a grand proud tradition of truth-tellers, of outsiders – the quirky people who just can’t stop themselves from writing, no matter what anyone else says to them. I sat at the display that represented his writing desk in his little writing gazebo and I wept, awe-struck at this knowing, this gift that John Steinbeck gave me. We are writers, and that is good. Salinas is MUCH different than it was in his day – glad you made it out of there without being shot (my husband’s family is from the Monterey area – we are there a lot). I’ve never read any of his work, but your post makes me want to now. I’m kind of jealous that you haven’t read it, because now you get to for the first time. His work is really wonderful. I didn’t get the feeling of danger in downtown Salinas. In fact, I was helped out by one of the most charming homeless people anywhere, Roger. Downtown has some lovely buildings. The most dangerous place is near the mall. Since my in-laws live in Marina they fill us in on the gang and police activity…of which there is a lot (of course, they also listen to the police scanner…so they hear the stuff that doesn’t always make the news). Still, it is a lovely town..mostly. Wow. You are truly a writer. I am proud to call you sister. And that must be his dog Charlie. Why yes it is. The camper “Rocinante” was right behind me as I I was taking that photo. I forgot that Charlie was a Standard. That is an amazing picture and I enjoyed reading how it affected you. Being (mostly) alone in a great museum is a special treat! Thanks, Mark. It was a profound experience. I have had several profound museum experiences. Maybe I should spend more time in museums.